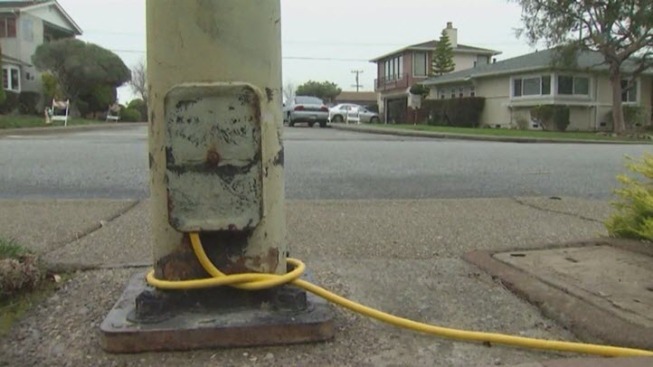 Some San Bruno residents left in the dark are being asked by city officials to power streetlights from their homes. Streetlights keep shorting out in the city's Crestmoor neighborhood. City officials in response are paying homeowners $50 a month to plug in a very tall nightlight until crews are able to fix the lights. "It's totally voluntary," Mayor Jim Ruane said. "Six or seven people have agreed to do it. Four more say they will. Only three or four have declined." Homeowners who have agreed to power streetlights signed a waiver of liability. "Just in case something happens in their home that the city has no control over," Ruane said. "Someone trips in their garage or they have some wiring that's defective, that protects the city." San Bruno is also spending $28,000 a month on renting temporary streetlights. Aging wiring below ground has confounded city crews trying to fix dozens of streetlights that fizzled out before Halloween. "We've had some break-ins in this neighborhood," resident Dolores Patterson said. "Not lately, but it's kind of scary to be so dark." The San Bruno City Council has approved hiring a firm to re-wire the streetlights after the new year. The job could take until March and cost as much as $350,000. Ruane said local taxes will not go up as a result. This month, holiday lights served more than a decorative purpose for resident Adil Asslan and his 5-year-old daughter, Nadine. "Luckily, we've had some Christmas lighting," Asslan said.